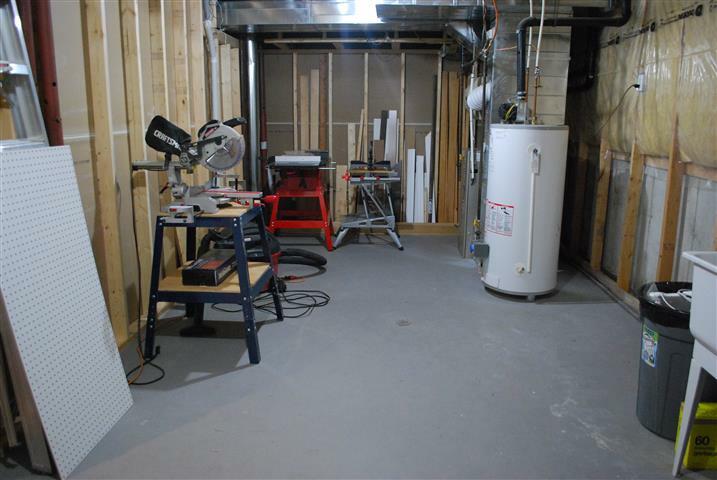 One thing I did not count on when we decided to finish our basement was how it was going to affect every single room in the rest of the house. Now that some of the furniture is going downstairs, and all the toys, we find every other room is now looking empty, or shabby, or both. And we’re also having to reorganize spaces we didn’t think much about during the finishing part. For the past few weeks we have stopped work on the “finished” area of the basement to look at the “unfinished” sections, parts I kind of thought, due to their “unfinished” name, would not require any work at all. First, we pulled everything out of our storage room. Remember what it looked like before? I am SO SO SO HAPPY about this. Yesterday I went down there just to do a little happy dance in the middle of the room. Sir Monkeypants worked really hard – and, I have to add, with help from all three kids with minimal complaining – to build these shelves. 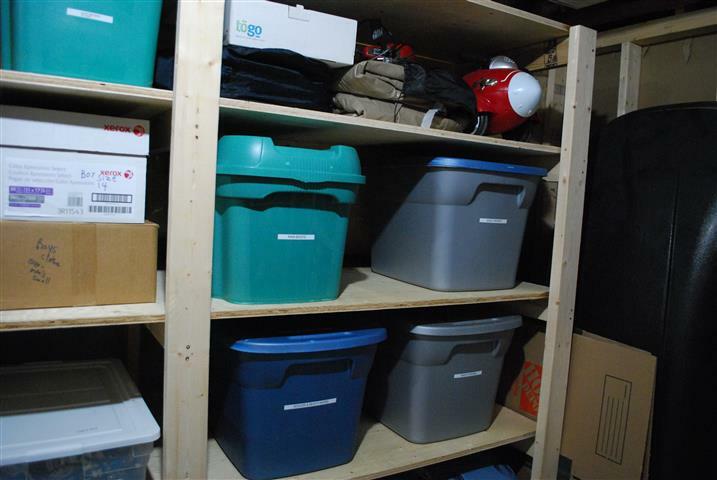 Then I worked really hard to organize stuff and put it all in bins and put it gleefully on shelves. And what’s that hiding in the corner? Why, it’s a beer fridge! Also home to vast amounts of watermelon when we are on soccer snack duty, and an ice cream cake in the freezer. I brought home the ice cream cake yesterday as a sample from Icy Cool Creations, which I will be writing about next month for SavvyMom, and while the kids were playing outside Sir Monkeypants and I tried a piece, and then we very quickly decided that the children DIDN’T NEED TO KNOW ABOUT THIS. Hidden ice cream cake makes beer fridges the BEST THING EVER, don’t you think? Once the storage room was done, I turned my attention to the work room across the hall. I wish I had a before picture to show you here, but try to imagine 10 years worth of tools and supplies and furniture and random boxes of junk being thrown in here. Every time we had to look for a tool or a container of screws or picture hanging wire or painters’ tape, we’d have to dig through piles of bins and tool boxes and the foot-high thick layer of stuff on the work bench, and half the time we couldn’t find what we needed and had to buy more anyway. Plus, we did not think ahead very well and while building the shelves for the storage room, every single thing in the work room got covered in an inch-thick layer of sawdust. OOPS. 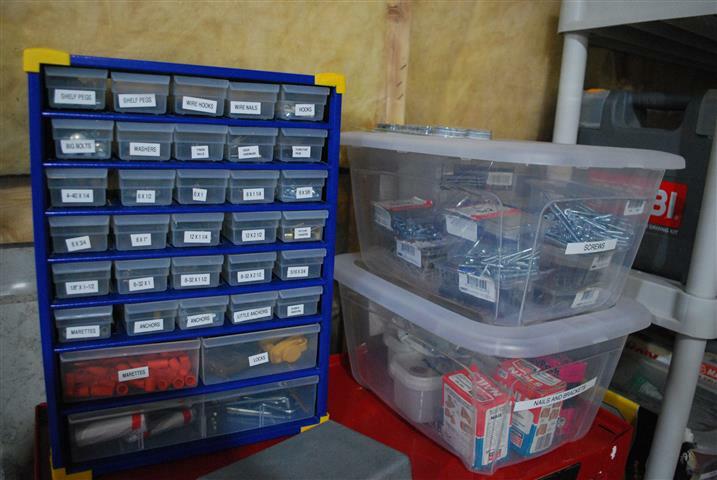 I have to say, sorting stuff and then labelling it is my nirvana. It’s like, better than chocolate. POSSIBLY even better than secret ice cream cake. And definitely, definitely, happy dance worthy. Did you know I can actually go into the work room and the storage room now in BARE FEET? And then FIND STUFF? It’s like it’s not even my house. Next up: we return our focus to the finished space and hope to actually start moving in some furniture soon, then it’s time to get all the toys, books, and video games in the house down there. Hopefully before September, but you know – that ice cream cake isn’t going to eat itself. i have serious storage room envy. That is so freakin’ awesome. But I do have one question: don’t you ever feel like you have too much stuff? I find that many things I put in bins, like you did, end up never coming out again. There are a few exceptions, of course, like Xmas decorations, wrapping paper for gifts, seasonal clutter, whatever…but one of the things I’m noticing while preparing FOR a major reno (I’m still in the packing/purging stages) is that I feel like we are drowning in stuff. Tools, nails and screws, paper, books, toys…there’s just so much of it. Our parents are both legendary hoarders so we have tried really hard to keep a lid on the clutter, but even then, while working on the basement we got rid of boxes and boxes of stuff we just weren’t using. It’s amazing how stuff can accumulate, especially if it’s all just piled up and you can’t actually see it. We’re planning on doing a big toy purge too, when it’s time to take everything downstairs. Hopefully we are left with stuff we are actively using – we do have one bin in there called “stuff we need to keep” which is full of some gift type items and memory type items that we feel we can’t part with but aren’t using. Everything else is seasonal – decorations for various holidays, off-season sports stuff, winter/beach wear, storage for winter boots. 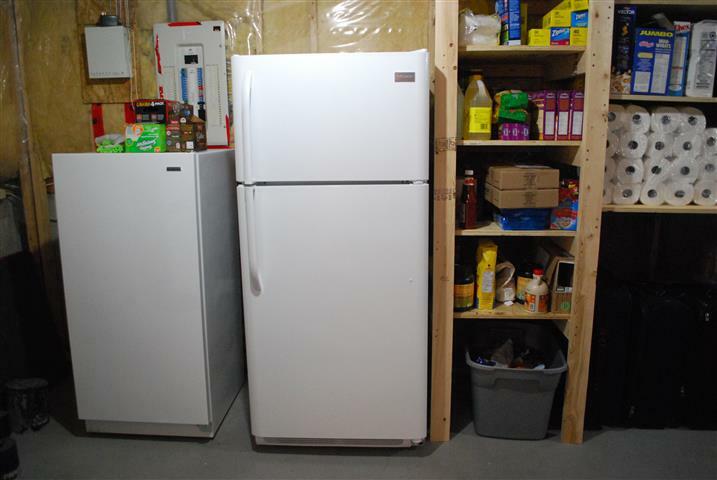 There’s also all our camping gear, and overflow from the kitchen – our kitchen is not huge and I have, literally, every appliance known to man (required as I have to home-cook everything the allergy kids eat) and so the back wall stores all that stuff. I am devoted to the purge, though – hope to stay on top of it. You must be mired in it right now but when you’re done you’ll just feel so FREE. Well – free-er :). Definitely some storage room envy here too. Damn you, California, with your basementless houses!!! I cannot imagine. Where would we put it all? Although, a lot of stuff in our storeroom is seasonal – we have three huge bins devoted to winter boots, ski equipment, and skates, for example. But still – where do you keep the Christmas decorations? We do have Xmas stuff stored, and we do have storage space, but it’s tiny – a little crawlspace underneath the stairs to the second floor behind the coat closet. It’s enough for that, a couple of suitcases, a musical instrument or two, a couple of boxes of CDs, and that’s about it. I guess we also have a walk-in closet in the master bedroom that’s really too small for its intended purpose so some stuff goes there too. 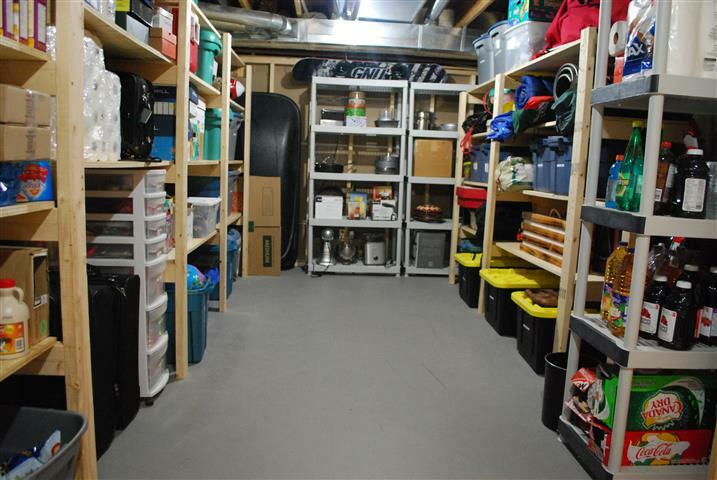 I think in California the garage fulfils the role of the basement for most people. That’s something we’ve never gotten used to, and even here there are distinct advantages to parking inside. I guess on that account it’s a lose-lose situation. Seriously jealous of all that space, the secret ice cream cake and the freezer. Basements were not high on the priority list in 1900. Looks great can’t wait to see the rest. I believe at one point Ghandi had his worldly possessions down to 10 items. One can only dream…gosh. I would be happy with ONE wooden spoon, one plate per person, that kind of thing, but NOOOOO…. 🙂 Sigh. Okay, now I have to go to my basement to put the laundry in the dryer and I don’t feel like it anymore because our basement is like your “before” 😆 Your organizing skills are impressive, the labelling + shelving is awesome. 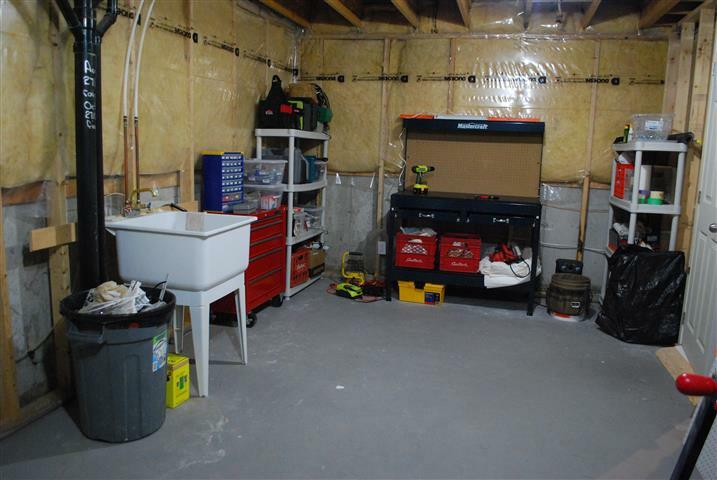 One day, I’ll do the basement… one day. Long live the label-maker! Looks awesome….achieving that level of organizational beauty and efficiency is a ton of work. Well Done. 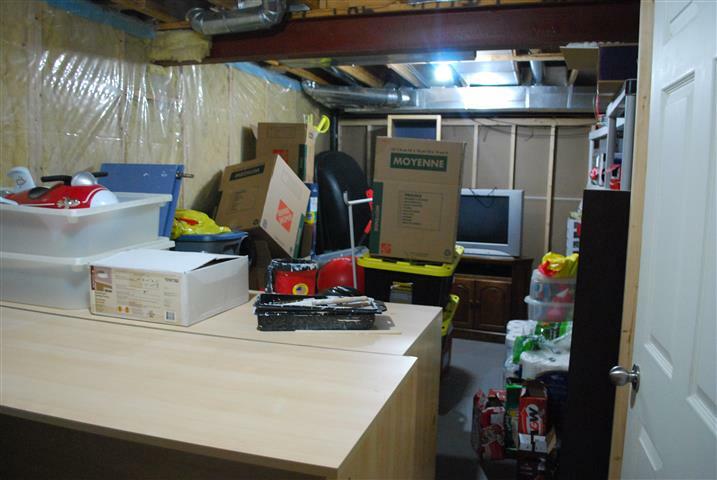 I am SO jealous of that organized basement!